I was camped at the mouth of Titus Canyon Rd in Death Valley NP, and upon rising at 6a, found it raining lightly outside with moderate winds. The forecasted storm had arrived and would keep the entire park (and indeed, much of the state) heavily overcast and precipitating the entire day. This was desert, right? 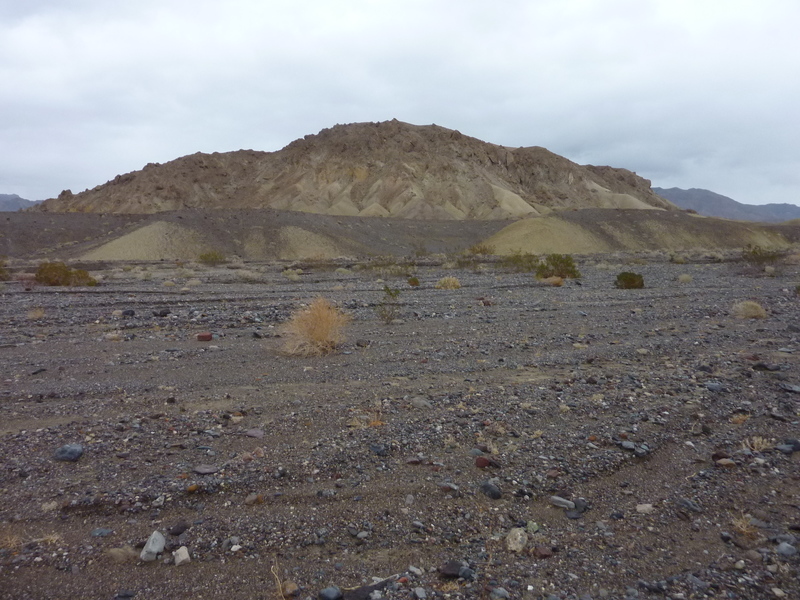 I had to remind myself that even desert regions get some precipitation and this week Death Valley was getting much of its meager yearly allotment. It will probably help bring a banner year for wildflowers, still months away. At the end of January there was little that could be said to be green. The ground was saturated with moisture, more than I've ever seen on my many visits to the desert. The Amargosa River was slowly flowing a light, muddy brown and in many places I walked today I could feel the cushioning effect of the saturated soils, occasionally sinking an inch or two where it felt more like quicksand. It was quite a change from the usual dry, hard earth found here most of the year. Because I had no idea how long the rain might last or how intense it could get, I decided to do some short hikes on my drive south through the park. I found a trio of such candidates along SR190 along Furnace Creek Wash. All of these are featured in Courtney Purcell's Rambles & Scrambles, though I didn't have the book with me for reference. I found them on my GPSr and winged it as I went along. None were more than a mile from where I parked, so how hard could they be? Found 2/3mi from the highway on the north side, this makes for a short but tricky ascent. Much of the peak is surrounded by soft, badland-style soils that can be treacherously unstable when wet. I went up one such route from the south but found a much better route down the southwest side where the slope was less steep and the footing more solid. I took a photo from the summit looking northwest towards Furnace Creek, but today wasn't one for views due to the weather conditions. Found on the south side of the road not far from the first summit, these two peaks are most easily reached from Twenty Mule Team Canyon and the scenic park road that winds through it. This was once a bustling mining district and there are still remains of such activity, but aside from some borax, little of value was ever extracted. The colorful canyons and badlands are quite picturesque, much like nearby Artist's Palette and Zabriskie Point. Cerro Blanco is the highpoint of a cream-colored ridge adjacent to the scenic drive. There are many informal foot trails found throughout the area. The Park Service doesn't seem to mind as there are no signs restricting hiking activity in the area. I started from the highpoint of the scenic drive found at the southeast end of the Cerro Blanco ridge, following a footpath up the soft feature as it heads northwest towards the highpoint. The trail traverses lower on the southwest side to avoid much of the ridge. There are good views overlooking 20-Mule Team Canyon and the Furnance Creek Wash from the summit. After returning to the van, I continued south to 20-Mule Team Peak, about 3/4mi in that direction. The easiest (and only reasonable) approach is from the northeast, following a series of lower-angle drainages that lead to the summit. There are some treacherous-looking badlands to the north of the summit that are best avoided. I found a minor variation on the way down that took me over a lower, white-colored ridgeline before descending into some interesting badland washes and back out on the remnants of an old mining road through the canyons. I drove back out to SR190 and continued southeast for 10mi to tackle a P1K in the Funeral Mountains that had eluded me on a previous effort. Found between Pyramid Peak and Bat Mountain, the highpoint of this rocky outcrop is a P1K and the highpoint of the Funeral Mountains Wilderness. Previously, I had climbed the eastern summit a mile from the highpoint thinking I had reached the highest point. Only later did I realize the western summit is slightly higher by 40ft. When I pulled off SR190 southwest of the summit it was raining a little heavier than it had been earlier while hiking the other three summits. Before I could get my act together to leave, the rain started coming down heavier yet and it caused me to delay starting. The clouds obscured all but the lower few hundred feet of the Funeral Mountains - there would be no views from this 5,300-foot summit today. I waited for just over an hour, reading my book while the rain oscillated between moderate and light. Eventually around 1p I decided it was time to brave the elements or punt altogether as I would run into daylight issues if I delayed any further. The six-mile roundtrip hike was an exercise in immersing myself in the elements - rain, snow, wind and cold. It might be described by others as "battling the elements" but I don't like that term which suggests a fight. When one side is completely indifferent and incapable of losing, it isn't really a fight. And though I was concerned more than a little at times, it was grand fun. Below about 4,500ft the terrain was wet, a cold wind blowing fiercely over the ridge roughly south to north. During the ascent, I found solice from the wind by traversing on the northwest side as much as I could. The rock was primarily limestone which afforded excellent traction even when wet. Once above 4,000ft there began to appear ice patches on the windward side of the rocks and shrubs, the result of freezing rain transitioning with the elevation gain. Above 4,500ft, the leeward side of the ridge was covered in an inch or two of snow, making travel on that side less pleasant. I would pause periodically to add a layer of clothing or change out my damp gloves, moving from leeward to windward side as the terrain and weather seemed to warrant. The wind grew steadily stronger the higher I went, roaring like a freight train near the summit. Had the summit been another 1,000ft higher I might have had to turn back, but at 5,340ft it seemed just about as much as I could manage without feeling desperate. Relying entirely on the GPSr for navigation (I certainly would have failed with map/compass on this one), I found my way to the summit where I found no cairn or register, all the summit rocks encrusted with snow and ice, and could hardly hear myself think. Snow was blowing ferociously across the summit, making it impossible to even pull out the camera for a picture. I had originally planned to take an alternate ridgeline on the descent, but was not feeling so confident given the weather conditions. It was much safer, I deemed, to simply follow the GPSr track back the way I came. I would have to refer to it every minute or so to keep heading in the right direction, down the correct forks in the ridgeline, back the way I'd ascended. A few momentary clearings of the clouds showed that I could probably have descended any slope and gotten back more easily than following the undulating ridgeline, but I insisted on following the safety of the GPSr track until I was nearly back off the ridge. The rain never let up, but the walk back across the valley floor was an easier affair with the lessening of the wind. My overmittens weren't as waterproof as I might have liked, leaving my wool gloves damp and my hands chilled by the time I returned to the van after 4:30p - I was happy this 4hr+ outing didn't last another hour or more. Hi Bob, I am curious if you could still any footprint evidence of my visit in November to 20 Mule Team (Monte Blanco). I came from the west canyon and descended the neat eroded wash you mention. Terrain seemd soft an dfragile so I tried to go gingerly. I don't recall any single particular set of footprints. There were paths that had been used by more than one person but no obvious recent set.